ST. GEORGE — Community members gathered at the newly completed Riverfront Medical Center Wednesday to take part in an open house and ribbon-cutting ceremony to celebrate the official opening of the new facility. The center, located at 617 E. Riverside Drive in St. George, houses offices and clinics for a variety of medical professionals to provide a unique and convenient location for patient care. Some medical professionals in the building include Desert Pain Specialists; Southern Utah Ear, Nose, and Throat; St. George Eye Center; St. George Orthopedic Spine; Fit Physical Therapy and Fusion Pharmacy. The building is the first of three to be built at the Riverside location and represents the first privately-funded office building to be built in St. George since 2008, according to a previous St. George News report. The other two buildings are in the design phase, said Tom Callister, the developer partner on the project. The 57,000-square-foot, three-story building was constructed using tilt-up concrete to create the frame, a cost-effective method of construction that allows for a more interesting and modern look. Hughes General Contractors oversaw the construction of the building which began in October and was completed on time, Callister said. 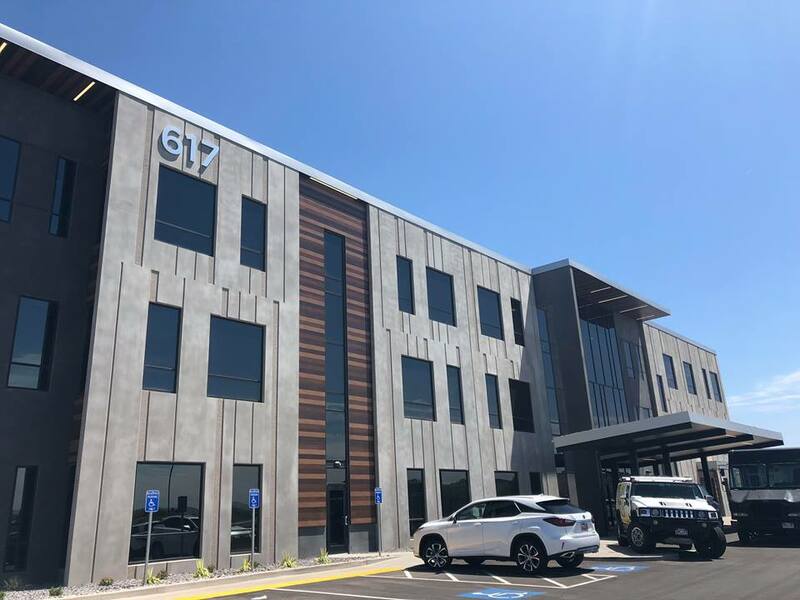 Four of the building’s tenants are open and seeing patients: St. George Eye Center, Southern Utah Ear, Nose, and Throat, Desert Pain Specialists and FIT Physical Therapy. The rest of the building’s occupants are set to open this summer. Callister said he is very pleased with how the first building turned out. The new facility was conceived by a group of physicians who wanted to own their own building and fulfill a need for the community to have a medical center that offered more than what St. George previously had. Mortensen said the new facility helps fill that gap. The public will now have access to a wide range of care all in one location. 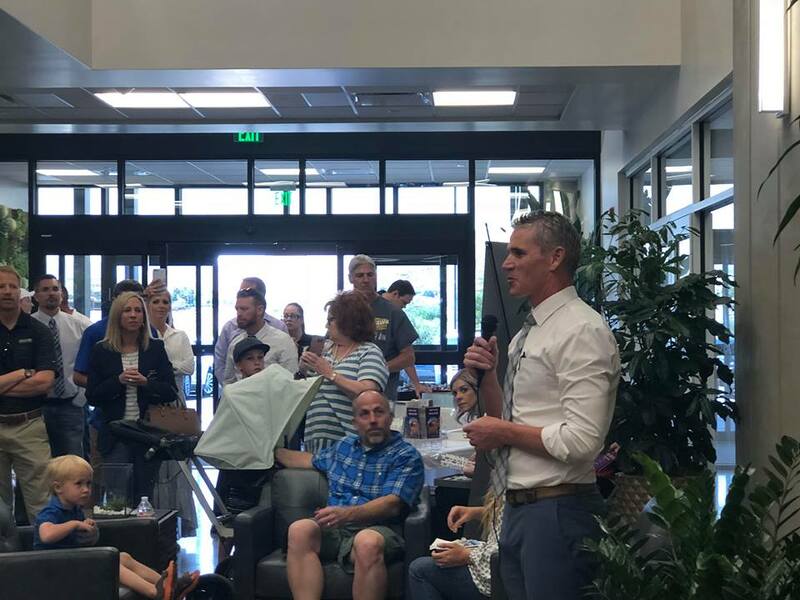 “We have a great group of physicians (in) this building,” said Dr. Court Empey at Desert Pain Specialists, expressing his gratitude for the designers and builders who created the beautiful space for the care providers. Beyond being a great place for patient care, Riverfront Medical Center is a carefully designed facility that blends function with form. Mortensen said that what he loves most about the building is its extreme style. The building’s simple and modern design is reflected both in its exterior and interior. The clean feel of the building is due both to the tilt-up concrete construction and the attention to detail given by the designers in creating an atmosphere where patients can feel comfortable. “This is a place where people are going to come when they don’t feel very well,” said Kaci Miller, the building’s interior designer. “If I’ve had a hand in creating an atmosphere that is different and unique … and it’s very warm, if I’ve had a hand in that then I am going to feel pretty successful. The response to the space has been phenomenal so far, Miller said. Having a state-of-the-art facility like Riverfront Medical Center in St. George is going to be a critical draw for the area to help attract and maintain talent in tech industries and medical research, Mortensen said. “I hope we see more of this moving forward,” he added. 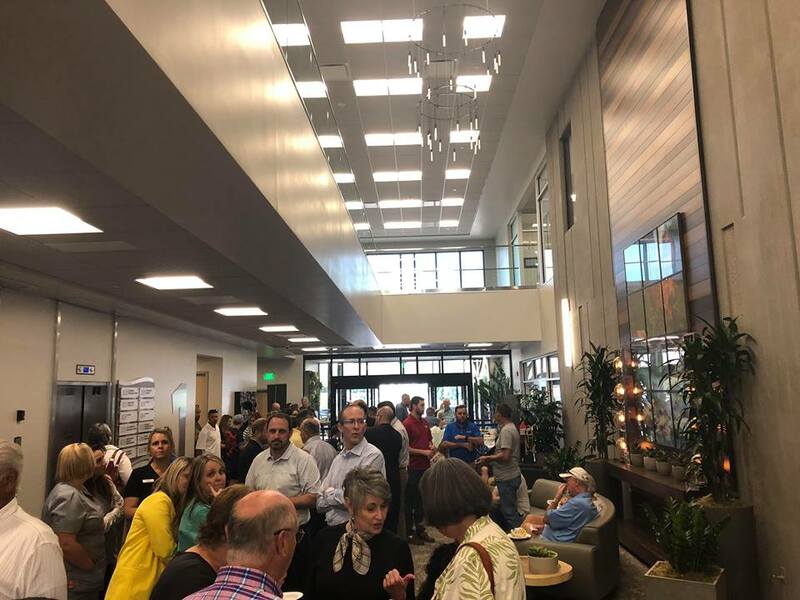 Wednesday’s open house saw a huge turnout of community members who came to tour the new facility, learn more about the health care providers in the building and participate in the ribbon-cutting led by the St. George Chamber of Commerce and members of the Dixie Sunshiners.